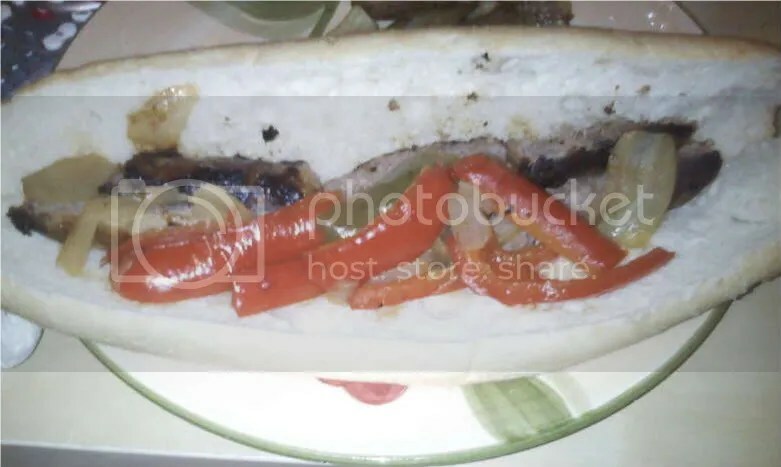 I saw the original recipe for sausage and peppers sandwich on Humble Recipes, and bookmarked it, because the husband loves sausage and peppers. After reading the recipe over a few times, I thought of a few changes I could make to this recipe. They turned out great! Don’t mind this picture, it was taken with my cell phone, as I left my camera at work! This makes 2 servings, and has 350 calories per serving. Heat oven to 400 degrees. Spray a large roasting pan with nonstick cooking spray. Place sausage in the pan and roast for 15 minutes. Place peppers, onion and potato in large bowl. Toss with olive oil, Italian seasoning, salt and pepper. Add vegetables to the roasting pan and stir to combine with sausage. Roast for an additional 45 minutes, stirring twice, until vegetables are tender. Remove from oven and stir in vinegar. To serve, spoon 1 generous cup of sausage and pepper over each toasted bun. My husband and I both are from cities that are known for their famous foods. I’m from Philadelphia, and as we all know, cheese steaks are our fame. My husband is from Buffalo and chicken fingers are their fame. But another amazing food in Buffalo is just their simple chicken finger subs. On Sundays, during football season, with being completely honest to you, is the one day where our meal isn’t very healthy. We decided that we wanted to try to re-create the chicken finger sub we often get when visting Buffalo, from John & Mary’s. Pre-heat oven to 425 degrees. Coat chicken breast with flour and then dip into egg. Once chicken breast has been dipped into egg, dip into bread crumbs. In a large skillet, heat the olive oil and pan fry the chicken breast for about 3 to 4 minutes. Transfer to a baking sheet, and bake for 10 minutes or until fully cooked. In a small bowl, mix hot sauce and butter, to your liking. Remember, the more butter added to sauce, the less spicy it will be. Once chicken is cooked, dip into sauce mixture, place back on baking sheet, place cheese on top, and put back in oven till cheese is melted. Serve on roll, with blue cheese if you like it and lettuce and tomato! My husband loves anything Dijon, so when I saw this recipe in the November 2009 issue of Woman’s Day, he was very excited to try it. It was very yummy! This makes 2 servings and 577 calories per serving. Heat oven to 350 degrees. Place a sheet of foil on your kitchen counter. Measure mustard and bread crumbs separately onto foil. Coat pork chops with mustard, then coat with bread crumbs. Heat oil in a large non stick skillet over medium high heat. Add chops and cook 2 to 3 minutes on each side until bread crumbs are browned. Transfer to a foil lined baking pan and bake for 5 minutes or untill cooked through. This version of baked pasta classic is rich and satisfying yet, easy to prepare. It also it’s a lightened up version, instead of using ricotta cheese, I used cottage cheese. It turned out just as yummy. The only difference is, is that the cottage cheese cooks it’s self away, so the shell it’s self isn’t as stuffed with cheese. I will definitely make this recipe again. This makes 4 manicotti and each manicotti has 204 calories. First, bring a pot of water to a boil and boil manicotti till all dente. Meanwhile, in a large bowl, combine sausage and cottage cheese. Stuff into manicotti shells. Place in greased 13 by 9 inch baking dish. Top with spaghetti sauce. Cover and bake at 350 degrees for 55 to 60 minutes or until meat thermometer inside into center of a shell reads 165 degrees. Uncover, sprinkle with mozzarella cheese. Bake 8 to 10 minutes longer or until cheese is melted. Let stand 5 minutes before serving. Another installment of Crock Pot Thursday! This recipe came from Pillsbury, 2009 Casserole Book. This makes servings and has 380 calories per serving. Spray slow cooker with cooking spray. In cooker, layer carrots, garlic, chicken, and beans. Sprinkle with salt and pepper. Pour broth and water over top; stir to combine. Cover; cook on low heat setting for 6 to 8 hours. Stir in tortellini, onions and basil. Increase heat setting to hight. Cover; cook 15 to 20 minutes longer or until tortellini are tender. Sprinkle servings with Parmesan cheese.